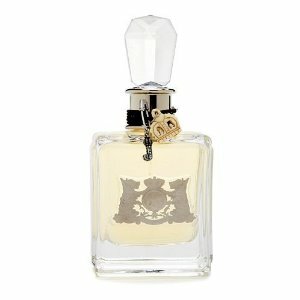 Juicy Couture Eau de Parfum has very mixed reviews on Sephora.com. Some ladies love the fragrance because they say its not to over powering. It's weird how one perfume can have so many different smells, but after reading reviews many ladies have different opinions on the scent. A few perfume guru's say Juicy Couture has a fruity undertone, while others think it is more floral. I think this fragrance might be one of those that you just have to test yourself to see if it's for you. Some other users have an opposite opinion about Juicy's scent describing it to be so strong that it gives them a headache. Also that it is nothing special and just smells like Britney Spears' "Curious". Watermelon, mandarin, and pink passion fruit combined with the sparkling freshness of bright marigold and green apple, enhanced by a splash of water hyacinth and crushed leaves. Wild rose with sophisticated princess lily and creamy tuberose. Caramel creme brulee and vanilla meld with elegant precious woods and patchouli. If you are interested in purchasing Juicy Couture Eau de Parfum it retails for $17.99(0.17oz mini)- $49.99 (6.7oz). I just had a sneaky squirt of this perfume the other day and I have to say I found it to be rather pleasant. You are currently browsing the archives for the Juicy Couture category.